Lego as usual has given us a great 2014 Christmas Advent Calendar. Pop the box open on December 1st and every day you will get to open a door that reveals a “mini-build” for an item to populate the holiday scene. Every year the figures vary, so it’s a fun tradition to follow even if you have done these before. Even if you aren’t interested in the religious aspect of Advent, the countdown-to-Santa is still fun for the little ones. For 2014, Lego has released three different advent calendars—this City theme, a Star Wars version, and a Friends (“girly”) one. 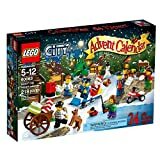 I always buy this City-theme Advent Calendar early in the fall: Lego makes a certain number of each theme and when they’re sold out, that’s it! Pros: fun mini holiday-themed Lego project every day in December! What’s not to love? Box is cleverly designed for use and reuse–a flap of the box swings open to reveal a Lego Cityscape backdrop with numbered doors. So exciting! Each day, you help build and populate the holiday city. Cons: the outside of the calendar box reveals most of the surprises that are inside–so they aren’t surprises when you open the doors. My preschool-aged son studied his calendar last year before we began and saw what was coming. In future years, I hope this may be solved by a peel-away exterior that leaves the box blank on the outside once it’s in use and on display. This is a small concern. I covered my box exterior with colored duct tape this year so we get real surprises. And the flap that poems to show a Cityscape is great. My boys (6 & 9) absolutely LOVE the Lego City Advent Calendar. They look forward to this every morning before school. My kids take turns (one gets the even numbers and the other gets the odd numbers) so neither misses out. We also get them each a chocolate advent calendar. Last year we went to Disney World over Thanksgiving and forgot to buy the calendar. The Lego store at Downtown Disney was sold out and they said by Thanksgiving you’re lucky to find them anywhere, so BUY IT NOW! Don’t wait or you will have to pay almost double on eBay (like I did). What a parent won’t do so your kids aren’t disappointed! !